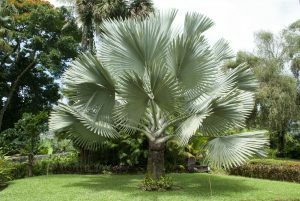 Stout with silvery blue-green fronds, the noble Silver Bismarck Palm turns heads like no other. This elegant large fan palm named after German Chancellor Otto von Bismarck is the prince of Southwest Florida landscapes, and for very good reason. Its massive crown of saucer-like fronds almost glows in lush, dark-green settings. Even its lineage from the diverse palm flora of Madagascar gives the Silver Bismarck a distinctive royal stature. Let’s start with those head-turning fronds. They’re a striking soft silver with a hint of bluish green, and grace a robust trunk that will grow up to 60 feet tall. You’ll be hard-pressed to find another specimen that’s as centerpiece-worthy, we assure you. 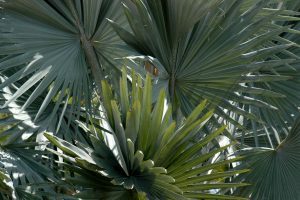 Evergreen and drought-tolerant, your Silver Bismarck Palm will thrive in full sun and require low-to-moderate water once you get it established. Heads up: it’s a fast grower with a canopy that spans up to 16 feet wide with giant, nearly round fronds. So keep that in mind when deciding where to plant it. The upside is that its big size blocks unwanted views beautifully – a huge benefit, so to speak. Light your Silver Bismarck from underneath and you’ll be amazed at how magnificent your landscape will look at night (and so will your neighbors). So how durable is this saucer-like giant? Very. Bismarck palms will suffer from cold damage but they quickly recover. (They can actually withstand temperatures down to 28 degrees, with the green variety being a bit more sensitive.) Silver Bismarck palms adapt to a wide range of soils, but please remember they need good drainage to prevent root rot. Overall, they’re very easy to grow after properly installed. The majesty of the Silver Bismarck palm is sure to start a conversation and will leave your friends envious of your choice, so why not explore further? If you’re interested in a professional design to incorporate the Silver Bismarck palm in your landscape, call ArtisTree Landscape Maintenance and Design at 941.488.8897. Our award-winning landscape designers will go above and beyond to make your dreams a reality. 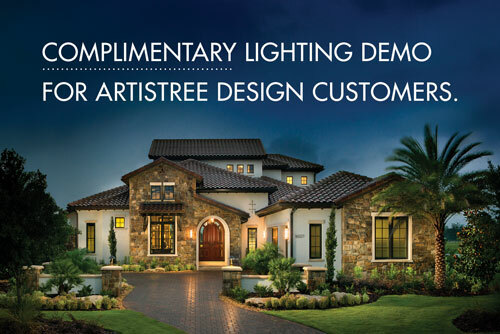 ArtisTree serves residents and maintenance-free communities in Manatee, Sarasota and Charlotte counties throughout Southwest Florida. ALIEN CROP CIRCLES OR JUST BROWN SPOTS?